coconut pudina chammanthi / side dish for biriyani | Simple and Delicious ! 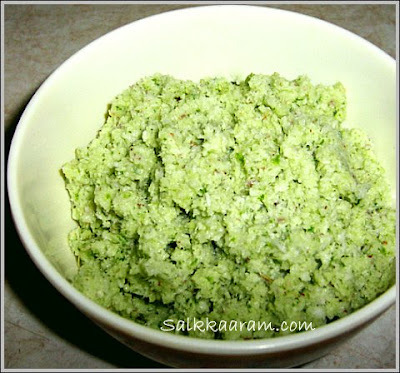 Grind together all the ingredients except lemon juice.Add lemon juice with the ground chutney and mix well. Its great going through your recipes & reading all the entertaining snippets that add a delightful pungency to your blog. All you young bloggers are so fortunate. When i was a young housewife with abs no culinary skills there were no friendly friends or family who would share their recipes so generously. My venture into the kitchen armed with useless cookbooks made cooking a nightmare 33 years ago & made me a very hesitant & diffident cook who hated cooking. Most people I know in my age group are reluctant to share their recipes or knowledge. Hi Seena its me Zeenath from Dhaka. In the Inji Puli recipe, you have not mentioned what to do with the green chilies? do u grind it with the ginger & garlic? Love to know for sure. It is great to hear from a senior friend from Dhaka! About Inji puli , sorry for missing the details, it happens when I type and post in a busy schedule.. :) Any way, I have edited for the recipe, pls check it..
Keep visiting here, hope to see your fbs too.. I like to add: Very Good work. Keep researching and keep sharing. I have not been able to print your recipes for her as yet. Will you allow printing from your site? Or, will you send to my personal mail ID if given to you?